It's HOT out there! 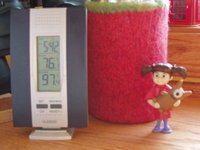 My indoor/outdoor Thermometer reminds me that I'm thankful to be inside with air conditioning and not in my backyard. This morning, after my Sunday morning SP8 blog reading, KC and I ventured out at 11:00 to a nearby (walking distance) cafe'. Yesterday, we checked their Sunday hours (10:00-3:00) and menu then made a plan for brunch. I had my heart set on huervos rancheros as we walked in the 90 degree (32C) heat. Unfortunately, when I ordered, I was informed that they don't serve breakfast after 10:30. They opened at 10:00 and breakfast is finished at 10:30! It may have been the heat, but it still didn't compute. Let me tell you, an apple spice muffin is NO substitute for huervos rancheros! I am still working on my KSKS design. 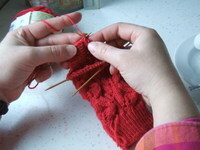 The test sock looks great, but the design needs a few adjustments in order to make an "easy to follow" pattern. Unfortunately, my KSKS pattern will need to wait until after this week. See this, this book is what will be occupying my week. I found out that our German friends will be visiting next weekend. It would be nice if the scrapbook from our European trip were finished. What you see here is the "rough draft". That means that I've picked out the page topics, the paper, the photos and other odd-bits and placed them in this binder. There are 50 double-sided pages. There are five working days in which to complete the 50 pages. You do the math! Any bets as to whether or not I finish the second sock!?! Did you have a nice Mother's Day? I did. How could I not with these two amazing kids! This is one of my favorite photos from our trip (framed; it made a lovely gift!). I am usually the one behind the camera, so there are very few photos of the three of us together. By no means are we "looking" our best (no make-up plus ponytails all around), but we are "at" our best...enjoying the moment and each other's company. Spending time with kids sharing conversation in quiet moments like this are SO important! I've had great examples in my life. Mom, Grandma, and Fairy Godmother have shown me the type of Mom I try to be and (someday) of the type of Grandma I'll want to be. Love, honesty, communication, and respect are the cornerstones to our relationships. Thank you, Ladies, for being great examples & mentors! Good women are easy to find in the knitting community as well. I spent part of yesterday doing what will now be part of my Sunday ritual: reading the SP8 blogs of my participants. (Some people read the Sunday paper...I read the blogs.) Most of my group has made contact with their spoilee and are getting to know them. My own spoiler has been in touch with me (Hello!) and it is so exciting to be part of this worldwide event. In knitting news, Gerta's socks should be finished later today. I'll let you know later. 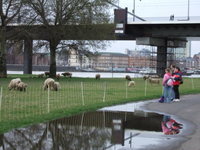 These sheep are IN Dusseldorf, Germany. 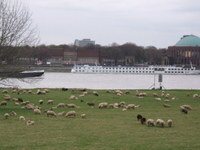 This is not a farm that we are at, this is the city park right along the Rhine River. Across the river is the City Center and directly behind us are upscale homes much like the Brownstone homes in Chicago just off LakeShore Drive. No, I didn't finish matching my group of Secret Pal 8 participants yesterday. Once again, the weathermen in WI were wrong. They said that it was supposed to be 56 and cloudy. Instead it was 72 and sunny. What do they know!?! I spent most of the day outside having a fight with the shrub roses. I would clip back the brambles and they would fight back by launching themselves at me. I have the battle scars from the gazillion thorns that put up a valiant effort to get me to stop hacking away at their "limbs". At one point, I almost gave up...but I knew that if I stopped my progress that I may never return to that nasty job. 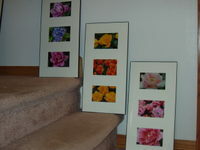 Now it is finished and sometime in June/July I will have beautiful roses once again smiling at me. I also picked the first 228 of the photos that we took in Europe (I think there are almost 700 altogether!). Panda took a bunch of tulip photos that she wanted to frame. She had SO many good shots, it was hard to choose. Now she has a memento from her trip AND a new elective for school. Thanks to Fairy Godmother, Panda had her own camera for the trip and, because of it, now has decided to add photography to next year's selection. 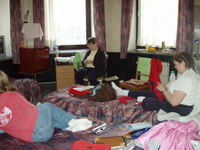 Do you know how much putting together a scrapbook of our trip is going to cut into my knitting time!?! Anyway, after having knit one sock for practically the entire twelve hours while on the way home from Amsterdam, once home I was both jet-lagged and sock-lagged (or would that be legged?). I needed a break. 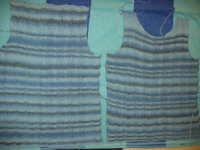 So I started the pullover "t-shirt" for Panda which is currently blocking downstairs. But now I've been home for a week and still my DPNs are vacant. I have an urge to start one but (and this is where the block is): who should I knit for, what yarn should I use and which pattern!?! First- Who? 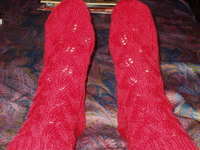 I look at the calendar and there are 3 birthdays coming up in the next four weeks for which I would like to complete socks for the recipients plus I'd like to make a "thank-you" pair for Gerta (pronounced Hair-ta). The birthdays...hmmm...well one of them is a friend who just so happens to share the same name as one of my favorite brands of sock yarn. That's the pair I'd like to start, but the yarn that I have upstairs bearing that name is not the right "fit" for the recipient. That would mean a trip to Ebay...."Danger, Will Robinson!"...Hmmmm. Maybe on a day that I have more willpower. The third birthday, which is actually the first chronologically, I'm not entirely sure that I want to give a pair of socks to the birthday girl. Not that she doesn't deserve them, just that she doesn't wear socks AT ALL during the summer. It would be better if I made her a pair for Christmas. Besides, I don't have the yarn in the house for her anyway. That brings me back to Gerta (she's the one on the right). 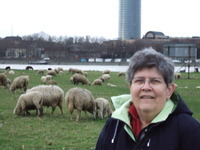 She is the distant cousin who rode with me while doing the "heritage" tour portion of our trip the the Netherlands (my mother and daughters rode with her husband, Hans). She was a lovely traveling partner and hostess. When I discovered that the hostel we were at did NOT have a laundry as I had mistakenly thought, Gerta took home and washed 3 days worth of laundry for my girls and me and had it waiting for us the next morning. She is an artist who sculpts with "cement". Beautiful things for the yard. I was impressed. Hmmmm....okay, you convinced me. Her socks should be first. Now to choose a pattern and raid the stash. Or maybe I need to raid the stash first and THEN choose a pattern. Oh, but which pattern!?! There are several I'd like to try. Why aren't there any "spring" colors in my stash!?! Hmmmm... Hopefully I'll be able to report tomorrow that I have overcome my "block" and no longer have naked DPNs! When you live next to the Bathroom Capital of the world (Kohler, WI) you tend to notice bathroom facilities when travelling. "What do you mean I have to pay to use the "public" restroom!?!" Anywhere from .20-1.50 Euro per person. Big flush or little flush! Or as my kids call it; "#1 or #2" Flush. This is so cool (and environmentally considerate). Petrol (gas) was 1.39 Euro per liter. That equals $7.00 per gallon people!!! I will no longer complain about $3.00 per gallon. In the Netherlands, there are more bikes than people. However, unlike WI, everything is FLAT; there are no rolling hills to deal with and make you sweat while you commute to work. In Amsterdam, this is the first lock that the thieves learn how to pick! I will continue to include these little tidbits from our trip over the next few weeks. In other news, there are only two more days left for you to sign up for Secret Pal 8. The deadline is April 30th at 11:59 EST. No bargaining. I am one of the hostesses and anxious for the process to begin. June, July and August are going to be a lot of fun! I knit on the plane as we headed to Amsterdam. 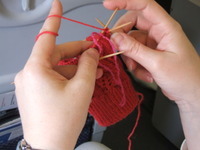 I knit on the train while in Germany. 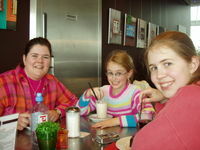 I knit on the boat as we toured the Rhine River at Cologne (in Germany it's "Koln"). Then we drove to Belgium. 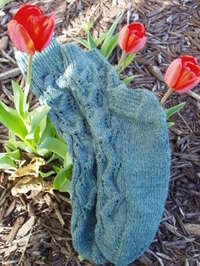 On Easter Sunday, since all of the shops were closed, I managed to steal away some time at our hotel to finish my socks. I will forever call them my "St. Nicholas socks" since I completed them in Sint Niklaas, Belgium at De Speigel Hotel. How appropriate that they should be red! 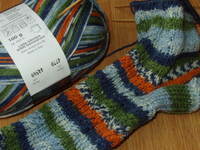 Next, I decided to stick with the same pattern and use the green yarn I'd brought along to work another pair of socks. 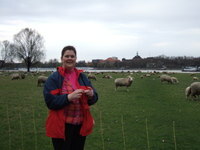 I knit them by the moat of the castle at Domburg. I finished one sock while on the shuttle bus to the hotel we stayed at when our plane from Amsterdam was cancelled. That inspired me to see if I could knit the second sock while flying home. I cast on when we got to the boarding gate and knit during the entire 9 hour flight. 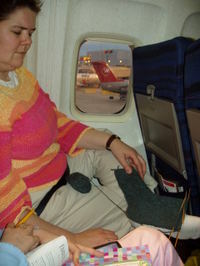 By the time we boarded the plane at Minneapolis, I was nearly finished with the second sock. By the time we landed in Milwaukee, another pair of socks was complete! Coming home I had plenty of room for my purchases. I had knit up three socks AND had mailed a packet while in Holland with yarn and goodies to Saartje so that I had room for the yarn purchases that I made. 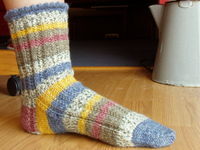 There are a few new sock patterns that I'd like to try...but first maybe something larger than socks. Yes, the Department of Homeland Security allowed me back into the country. The trip was great. I will be posting lots of photos and information in the future about different things. 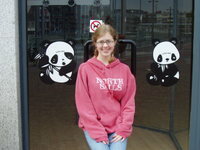 Unfortunately, most of the places where I had internet access weren't convenient for posting to the blog. Thanks for your patience. We are glad to be home and I think last night we may have crossed the final hurdle of catching up on sleep. Monday I got up in Amsterdam at 7:30 AM (12:30 AM local time) and never slept a wink until collapsing at home at midnight...23.5 hours later! Needless to say, by last night I was unable to form cohesive statements and didn't even attempt to post. Sorry. Now, the lack of shopping was not due to lack of trying. We saw more shops than we actually shopped at. Unfortunately, they were closed due to the Easter Holiday. In Europe, theyobserve Good Friday, Easter Sunday, AND Easter Monday and the shops are closed. 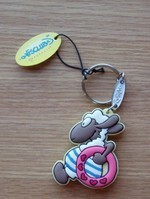 But I did find lots of cute sheep items. 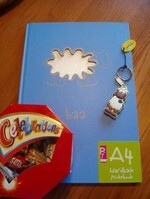 The notebook and keyrings were so cool. I got a whole variety of them to use with SP8. 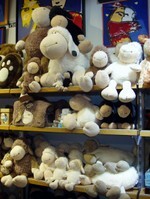 I would have liked to bring the largest of these stuffed sheep home with me, but I settled for the little black and white ones that you see in this photo between the largest one's feet. 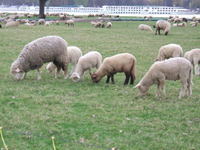 There will be plenty of sheep photos shown on this blog in upcoming posts. We saw a large number of flocks as we traveled about. In the meantime, it's good to be home and I have a LOT to catch up on. Well, we were all set to return to the US today but our flight was cancelled. We are "stuck"in Amsterdam for one more day. As you've noticed, I haven't been able to get on anywhere to load photos. In the meantime, don't forget the contest. 1) How many individual socks will I complete? 2) How many skeins of yarn will I purchase? tiebreaker 3) How many shops will I visit? The answer (and winner) will be posted here on Tuesday...assuming I make it home from Amsterdam! Today's destination, our final, is Amsterdam. For the next three nights we'll be staying at the Stayokay Hostel at Vondelpark. The buildings were previously the home to the Girl's Housekeeping School (my Mom could have been an instructor here!) until 1998. Over the next few days I would like to get to the Anne Frank House, Panda would like to get to the Van Gogh Museum (she shares a birthday with Van Gogh), Mom and Aunt are anxious to get to the tulip fields, and KC wants to get to the diamond centers. That's right, the 9 yr-old wants to watch them work the diamonds. Her hope is to come home with one, "It IS my birthstone afterall." I just think to myself, "Go ahead, Honey. If you get one now, you may not be anxious to get one later in life!" We'll have WIFI access here, so I hope to post some photos and stories.